WHITE PADDED CHAIR SUITABLE FOR NICE EVENTS. White, Resin, Folding Chair, Crafted From 2 Component Resin, An Outer, Smooth All Weather Resistant Aesthetic Skin & An Inner Expanded Closed Cell Modified Resin Core With High Mechanical Resistance & Gives Exceptional Strength, UV Protected To Prevent Fading During Outdoor Use, Flexible Padded Resin Seat Snaps In & Out For Easy Cleaning Without Any Tools, Stack Easily, Horizontally & Vertically, Come Equipped With An Interlocking Feature That Makes Stacking & Moving Storing Them Quite Simple. 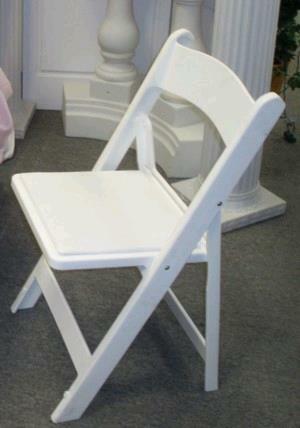 * Please call us with any questions about our chair white plastic w/pad rentals in Lake Charles and Moss Bluff LA.